The most common roofing material in America is the classic asphalt shingle. But even they have variations that you might not know about. Pan out for a wider view and you’ll find a wide range of roofing in so many colors and designs that it boggles the mind. Some materials are only suitable in specific climates and on a certain type of roof. Others, you may find anywhere in the country. Before you inspect your first roof, here’s what you need to know about design and the roofing that you’ll encounter most often. Gable: High peaks and triangles, often more than one, sometimes with dormers or small windows that project out of the roof slope. Dormers have their own small roofs, as well. Hip: This style is also peaked. All sides of the roof, usually four, meet at the center top and gently slope out to the walls on each side of the house. Gambrel: If you know the classic barn roof, you know the gambrel roof style. It’s a two-sided roof, usually on the left and right of the house, with two distinct slopes on each side. It gives a more rounded look to the roof than a gable or hip style, as it appears to wrap across the top and down both sides to the walls. Mansard: Quite a fancy roof, this style combines the gambrel and hip designs into one. In most homes, a mansard roof has two distinct sloped on each of its four sides. It gives the appearance of a squared-off cap on top of the house. Pitched: Most roofs have a pitch or angle, but some pitched roofs don’t fit into another style category. Pitch helps water run off and adds to the aesthetics of the architectural style. A roof that’s pitched may have only one side and a steep pitch, similar to the roof of a lean-to shed, or it may have an arrangement of different sides, each with a different pitch. 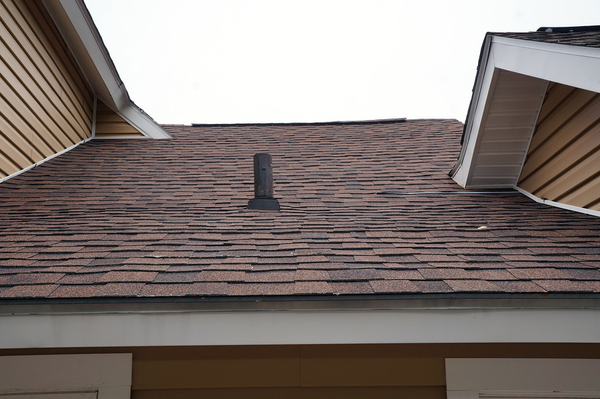 Roof penetrations, flashing and other details can shorten or lengthen the life of roof shingles. Asphalt shingles: The staple of American roofing, these shingles are suitable for almost every architectural style. They might not be the most period-correct for a historic house, but they’re still serviceable, durable and don’t necessarily detract from the overall look. Wood Shingles and Shakes: Wood shakes and shingles are tough, low maintenance and can last as long as asphalt, if not longer. Shingles are generally thinner than shakes, which were traditionally hand split instead of sawn like a shingle. Ecoshel says they’re both usually machine sawn. 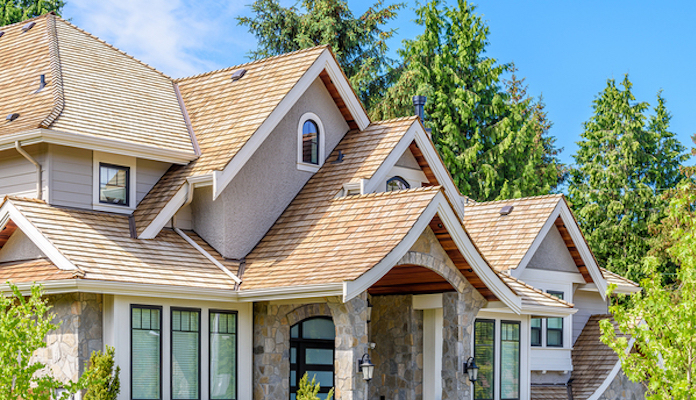 Shake and shingle roofs are common in the Northeast and along almost every coast. They have a classic beach house look. Wood is a fire hazard, so it’s not used in some parts of the country. Synthetic or Rubber Roofing: Rubber can look like almost anything if it’s processed the right way. Some rubber roofing looks virtually identical to slate, and some is similar enough to wood shingles and shakes to look appropriate on a bungalow. Rubber is lighter than slate or wood, and it’s significantly less expensive. Not every house has shingles. Where there’s no snowfall, flat roofs with a 10-degree pitch shed enough water to protect the home. In the southwest and in tropical locations, you might find clay tiles. But on most American homes, shingles offer protection from the elements, longevity, fire protection, and low maintenance. Roofing materials cover only one topic that you’ll dig deeper into when you enroll with ICA School’s home inspector education program. While you study at your own pace, you’ll learn about electrical, plumbing, interiors, exteriors and almost everything from top to bottom. Ready to begin? Enroll now and start learning today. Is Home Inspecting the Perfect Retirement Career?